It’s that time of year again…..when a young mans (and mature lady’s!) thoughts turn to love and in particular to weddings. February ended with the nuptials of my lovely niece, Kirsty, to her charming fiancé James and I was privileged to read a few words of wisdom at the service. Now as March begins it’s all hands to the plough as final preparations are made for the wedding of our daughter Debbie to Matt at Easter. Debbie is a chip off the female block in the family as she has been teaching drama classes for several years now and so it will be no surprise to hear that the wedding will be quite a theatrical event! Anyway, work must go on and my diary is still pretty busy during March. Before I get onto that, I told you about my impending trip to Dubai last month. I would thoroughly recommend the destination if you want a complete rest. Wonderful food and excellent service. The weather was perfect with wall to wall sunshine all week and temperatures in the mid to high 20’s. I had arranged two business meetings while I was there and both sessions were extremely useful and encouraging. I met senior executives from both the Jumeirah Beach Resorts and Dynamic Training with a view to my offering voice development, pronunciation training and presentation skills to staff and senior management. I am very hopeful that something will result from these initial contacts and will let you know what transpires. I began February with a lecture on using the voice in the examination room to about 25 examiners from the British Theatre Dance Association in Leicester. There was a great deal of interest in what I had to say with some stimulating exchanges throughout – a very productive session I think. New business clients during the month have included a lady who tenses up every time she tries to use her voice; head of H.R. at a major Midlands hospital working on clarity and purpose of speech in her work; a young lady who is finding interviews difficult because of her shyness; an engineer returning for some refresher sessions after a year’s break and a business woman who works in the U.K. and Scandinavia and wants to improve her communication on the phone and in meetings. My examining work in all areas of oral communication for LAMDA comes to the fore in March which is always a busy month. I can be assessing all ages from 5 to 95 in subjects as diverse as Acting, Public Speaking, Mime, Musical Theatre, Speaking of Verse and Prose, Reading for Performance and Spoken English. Levels range from introductory to Diplomas and days can be a complete mixture so it’s interesting and challenging too! Before Easter I am working in Leicester, Hampshire, Plymouth and Shrewsbury. 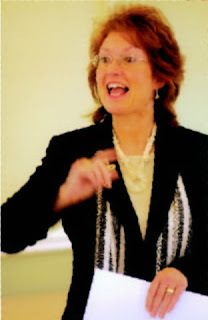 I am Voice Consultant for Ready4Life – look at http://www.ready4life.co.uk/ – an innovative company run by American, Linda Thomson which equips 6th formers with the sills needed to make the jump into the adult business world. We are delivering workshops for 100 teenagers at a Cambridge school this month where I will be lecturing on understanding how to use the voice and skills for interviews. I also have another speaking engagement this month when I lecture on ‘Voice Matters’ to the Women in Management in Leicester. I shall be exhibiting at the Access 2 business Expo which takes place at the Ramada Jarvis Hotel, Leicester on March 13th. If you would like to come along, the business exhibition takes place from 11.00am to 1.00pm with a very interesting mix of stands. Lunch follows with an average of 70 to 90 people to network with. Look at http://www.access2businessuk.com/ or contact me to register as my guest. I shall be giving away my C.D. ‘Voice Matters’ with 30 minutes of vocal tips so how can you resist? Networking really does work. A recent contact made at the ‘Leadership Lunch’ at Aston Wood Golf Club has resulted in a request to go and meet the head of training at a major accountancy firm in Bristol with a view to delivering voice coaching and presentation skills training to their management team. I shall end March with two very different workshops. The first is a half day voice Protection practical session for Aerodance trainers in Sussex and the 2nd is a half day workshop on Vocal Development and Presentation Skills for the institute of Agricultural Secretaries and Administrators in Telford. So, I’ve got a pretty busy month ahead but I intend to enjoy the lead-up to my daughter’s wedding and obviously the day itself. It would be lovely if the sun could come out for Easter so offer a prayer or two please! I am always delighted to hear your comments on my blog or anything else about the voice you would like to know. If you are using your voice all day drink plenty of water and avoid caffeine and alcohol to help avoid tiredness and tightness in the vocal cords. Comments Off on Spring thoughts………….